Crêpe paper party streamers are interesting for children. Many advantages are associated with the use of party streamers. Their price, since they are very inexpensive. They can easily be found in big-box or dollar stores. You can recycle them after parties. They can be used several times for a variety of activities. They are available in a wide range of bold and pretty colors. They are light and flexible. Here are a few ways you can use party streamers within your daycare. Although using party streamers with babies and toddlers isn't dangerous, you must watch them closely to avoid little ones putting them in their mouth and swallowing tiny pieces of paper. Certain colors can stain when mixed with saliva. I tested red and pink party streamers and they did not stain, but just to be safe, I suggest you perform your own testing before using them with children. Basically, supervision is necessary. You may want to give younger children their pacifier, if they have one. Let's begin with a motor skills activity. Party streamers are sold in rolls. Hand your group a few rolls and let them explore them as they wish. What will they do with them? If they don't think of it on their own, encourage them to roll the party streamers out on the floor. Here is another interesting motor skills activity. Encourage children to wrap the party streamers around different objects within your daycare. Around people: Children will like to wrap the party streamers around their friends' waist, arms, feet, legs, head, etc. Be sure to name the body parts they wrap with streamers. Around furniture items and toys: They will love wrapping the streamers around chairs, your table, stuffed animals, a cushion, etc. To help children, use small pieces of adhesive tape to hold the streamers in place, especially if the items they choose to wrap are quite big. Outside: Children can wrap streamers around a tree trunk or tree branches. If you have posts in your yard, children will love to decorate them with streamers of different colors. Children enjoy tearing and it's a good thing since tearing represents one of the first steps in learning to cut. Party streamers are easy to tear into pieces since they are quite thin. Collect all the torn pieces for the activities below. Because they are very light, party streamers can safely be tossed up into the air. Once children have torn several pieces, invite them to place them on a parachute or blanket to send them flying. They will enjoy watching them fall gently to the floor. If you have access to a balcony or elevated porch, you could drop your party streamer pieces from it and watch them flutter to the ground. Children will love to pick them up and start over again. Use your phone to record their fall and watch the video in slow motion with your group for a different take on the show. You may also blow on the party streamer pieces to send them flying. Show children how they can deposit a piece on their hand and blow on it or tip their head back, place a piece on their mouth and propel it upwards using only their breath. Cut several party streamer pieces. Give each child one or two pieces. Invite them to hold one end of each piece in their hand. Play music. Let children move the streamers to the sound of the music. Be sure to alternate soft music with fast-paced music. If you wish, you may also stop the music from time to time and encourage children to remain perfectly still until the music starts again. Rolls of party streamers can easily be transported to the playground, your yard, or a nearby soccer field. Children will love running with long party streamers in their hands on a windy day. Since they are featherlight, the party streamers will bounce along behind them. Tie them around their head to represent bandanas. Tie them around their waist or slide them under their belt to represent Hawaiian hula skirts. Wrap them around their wrists to create bracelets (use adhesive tape to tie the ends together). Tie them loosely around their neck to represent necklaces. Party streamers are easy to glue on cardboard or other surfaces, such as boxes. Their colors and texture make them perfect for creating a wide range of artwork. They are sure to spark children's creativity. Use different colors of party streamers to decorate a tree in your yard. Simply hang streamers vertically from the branches. On a windy day, children will enjoy watching the streamers bounce around. Use adhesive tape to secure the top of each piece to a branch. You can organize a picnic under your decorated tree to give children the opportunity to admire the streamers. 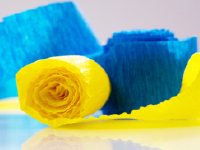 Play with party streamers to help children learn to name different colors. If you wish, you can use a single color to decorate your daycare each day. By cutting party streamers into pieces of different lengths, you can explore the concepts "long" and "short" with your group. Have fun comparing the length of different pieces to identify the longer and shorter pieces. Of course, decorating the ceiling is what first comes to mind when you think of party streamers. Here are a few other ways you can use the streamers to decorate your daycare. Hang them from one end of your daycare to the opposite end. Hang them vertically and glue a picture or illustration to the tip of each party streamer piece. Use them to display children's drawings and artwork in a hallway to create a colourful exhibition. Hang blue party streamers to represent waves and hang construction paper fish from the ceiling to make it look as if the fish are swimming in the water.